2 tbsp. grated Parmesan cheese. Peel plantain, cut into smaller pieces. Boil in water with 1 tbsp salt for 20 minutes or until fork tender. Drain and mash in a mortar & pestle until smooth. Transfer to a bowl, add the butter, Parmesan cheese and black pepper. Mix thoroughly then form into a large ball, slice and serve. …Or it could be formed into smaller individual balls. 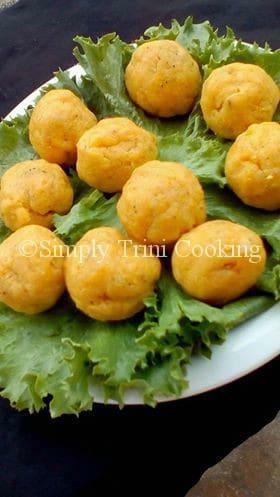 This is a wonderful side dish for stewed meats, fish, callaloo and or peas. !